That Leonard Cohen and Sharon Robinson used Constantine Cavafy’s poem “The God forsakes Antony” written in 1911, as inspiration for their song/poem “Alexandra Leaving” is not news. The first surprise is how the songwriters have taken Cavafy’s historically based poem and transformed it into a love poem. Antony, of course, is Marcus Antonius, Cleopatra’s husband. When I compared the Cavafy poem with Cohen’s new creation, I was struck by just how much of the poem/song was made from direct and associative borrowings from Cavafy’s poem. I’ve copied both pieces below; you’ll probably find even more relationships between the two than I have. Cohen and Robinson transformed phrases like ‘the Alexandria you are losing’ to ‘Alexandra lost’. They take the title idea of a god, use it in the second line as ‘some deity preparing to depart’, and as Alexandra ‘leaving with her lord’. They write lines like “Do not choose a coward’s explanation” from “don’t degrade yourself with empty hopes like these”. The whole tone of Cavafy’s poem is echoed in couplets such as: “Do not say the moment was imagined/ Do not stoop to strategies like this”. There is play with homonyms: from ‘whine’ to ‘wine, and from ‘mourn’ to ‘morn(ing)’. All the desire of Antony for Cleopatra and the consequent sadnesses and the loss of the Alexandria Donations comes across hauntingly in Cohen’s love-based poem. The phrase “crucifix uncrossed” may have been inspired by Cavafy’s first name of Constantine, as the Emperor Constantine’s mother is supposed to have discovered the True Cross. It’s as if Leonard and Sharon cut up a copy of the poem into all its disparate parts, shook them up in a paper bag and poured them on to a tabletop next to a bottle of ouzo. It’s cool in the white- plastered room, and the shadows outside run from blue to deep purple as they work. They are excited about the idea they’ve come up with, and immerse themselves immediately in the self-delegated task of making something new, humming along as musical phrases come to them, making a game of it to see just how much of “Alexandria” they could integrate into “Alexandra”. We poets/songwriters all do this, take poetry or music with us from the country we are visiting to try to come closer to the heart of that country. I took Chinese poetry in my suitcase when I went to China, sat reading John Ashbery and Kenneth Koch in bars on a trip to New York. Unfortunately, I didn’t come away with anything like Alexandra’s Leaving. But masterpieces or not, good poems can be made in this way, and writers should not shy away from looking at the fine writings of others, whether novel, poem, or article on poetics as grist for the mill. I’m intrigued by the richness that can be developed by getting into the works of other creators, and how that richness can come out as completely different works. Ekphrastic poems look at Art from the inside out. Many great poems happen while the writer is lost in a favourite piece of music, when the music muse suddenly becomes the writing muse. Now the original feels more intimate and important to the writer who has delved into it, examined it, tried to climb inside to see how and why it worked. When I look at how closely and caringly Cohen and Robinson examined Cavafy’s poem, and how they dared to turn the parts of the original into something completely different while not losing the dignity and solemnity of the original, I see how this transposition validates a certain Japanese way of thinking. 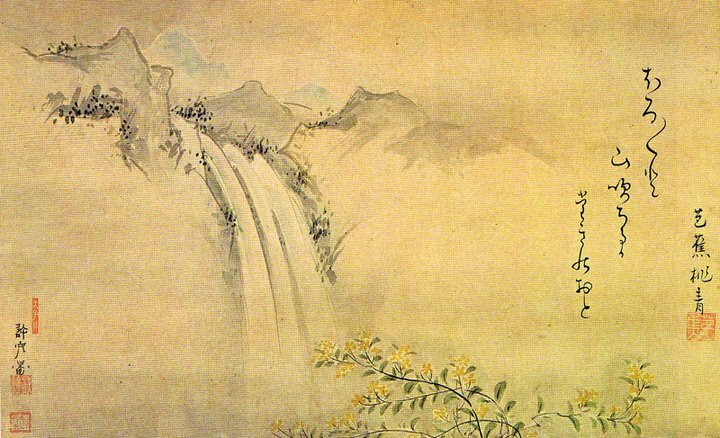 The Japanese venerate their master artists and writers by recognizing their mastery, by not making ‘originality’ sacrosanct. I leave you with Leonard Cohen, Sharon Robinson, and Constantine P. Cavafy. Suddenly the night has grown colder. The god of love preparing to depart. They slip between the sentries of the heart. They fall among the voices and the wine. Say goodbye to Alexandra leaving. Then say goodbye to Alexandra lost. Your firm commitments tangible again. Alexandra leaving with her lord. that hides behind the cause and the effect.